NAMM 2013 PRESS RELEASE: PreSonus announces the Sceptre CoActual monitors. Featuring an advanced coaxial design that works integrally with a 32-bit, 96 kHz, dual-core processor using Fulcrum Acoustic's TQ™ Temporal Equalization technology, Spectre CoActual monitors deliver clarity and coherence that has previously only been available in ultra-high-end systems. Yet they are an affordable investment for project-studio owners—a first for DSP-controlled, TQ-based systems. The series includes two models. The Sceptre S8 CoActual Studio Monitor features combines an 8-inch low/mid-frequency driver and a 1.73-inch (44 mm), horn-loaded, high-frequency transducer into a single coaxial unit with aligned voice coils. The Sceptre S6 CoActual Studio Monitor's coaxial speaker integrates a 6.5-inch low/mid-frequency driver and a 1.34-inch (34 mm), horn-loaded, high-frequency transducer. Both models have acoustic ports. "Speaker designers have long been aware that coaxial designs offer the advantages of a single point source for a consistent acoustic center and a symmetrical dispersion pattern," notes PreSonus Executive VP of Product Development John Bastianelli. "But until time-based DSP became affordable, designing coaxial systems without a variety of acoustic anomalies has been extremely expensive." Through intensive collaboration with Fulcrum Acoustics' Dave Gunness, PreSonus software designers were able to incorporate Fulcrum's Temporal EQ algorithms employing multiple, fully addressable Finite Impulse Response (FIR) filters. Gunness was also responsible for final tuning and voicing of both Spectre-series monitors. According to Bastianelli, "This high-tech approach requires massive amounts of DSP and subtle, sophisticated transducer design, which is why such systems have, in the past, been limited to very high-end systems with external processors. Clearly, PreSonus Sceptre CoActual studio monitors represent a huge price-performance breakthrough." Sceptre monitors include controls that enable full integration into any studio environment. A four-position Acoustic Space switch controls a second-order shelving filter center at 100 Hz, with four attenuation settings (no attenuation, -1.5 dB, -3 dB, and -6 dB) so that you can account for the bass response relative to room dimensions and speaker placement. A High Pass switch sets the second-order slope, 12 dB/octave filter's low-frequency cutoff to linear, 60 Hz, 80 Hz, or 100 Hz. A High-Frequency Driver Adjust switch adjusts the tweeter's overall level to linear (0 dB), +1 dB, -1.5 dB, or -4 dB. The Sensitivity control ranges from +4 dBu to -10 dBV. All Sceptre-series monitors offer RF shielding, current-output limiting, and over-temperature protection and have internal power supplies with IEC connectors and power switches with on/off LEDs. An amplifier "soft start" feature eliminates popping on power-up. 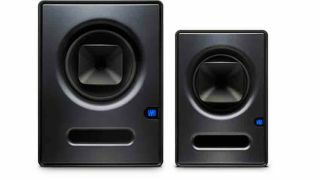 PreSonus Sceptre CoActual-series monitors are expected to be available in the first quarter of 2013.